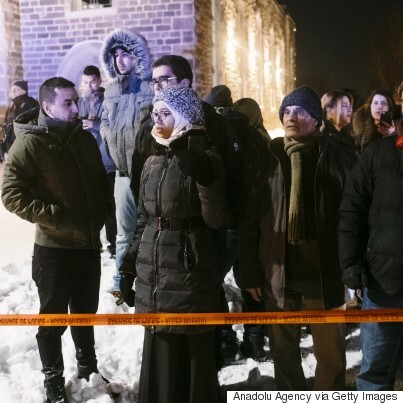 Six people were killed and eight others injured when attackers opened fire in a Quebec City mosque, shortly after Sunday evening prayers. “We condemn this terrorist attack on Muslims in a centre of worship and refuge," said Prime Minister Justin Trudeau in a statement. A joint terrorism task force that includes provincial police, the RCMP and Montreal police has been deployed. Two men in custody have been identified as the gunmen, according to media reports on Monday. A witness told Radio-Canada that he saw two men wearing black ski masks enter the Islamic Cultural Centre around 7:45 pm ET. One yelled something to do with "Allah" in a “strong Quebecois accent," he recalled. He said he wasn’t sure what kind of weapons the suspects had, because his attention shifted to people who were suddenly hurt. "As soon as I saw the person that was near me fall ... we all threw ourselves on the ground,” he said. “Six people who were standing and praying, they died." The victims, all men, are between 39 and about 60, RCMP national security Supt. Martin Plante told reporters at a press conference Monday morning. Plante said police apprehended one of the suspects at the scene around 7:55 p.m., while another suspect called 911 around 8:10 p.m. and identified himself. He was arrested about an hour later near Ile-d'Orleans, just east of Quebec City's downtown core. At the Monday press conference, police declined to provide any identifying details about the suspects beyond the fact that they are both male and are in their late 20s or early 30s. They also would not talk about the type of firearms used in the slayings. On Sunday evening, Christine Coulombe, spokeswoman for the provincial police force, said 39 other people in the centre at the time of the shooting were not hurt. "Nothing right now makes us believe that there would be other suspects related to this event. However, you'll understand that we're not taking any chances, so we are making the necessary verifications to ensure that there are none," Couloumbe said. Mohamed Yangui, the mosque's president, told TVA that there are usually 60 to 100 people at the mosque on Sunday nights. Live video posted to the centre's Facebook page showed the immediate response by emergency crews in the Sainte-Foy neighbourhood. One of the people behind the camera can be heard saying in Arabic: "He's escaped. He was on his feet, he's escaped." Another man begins naming people who were inside the mosque, but is told to stop in order to avoid worrying anyone who is watching the live video. "This is the result of Trump," says a bystander in Arabic. U.S. President Donald Trump signed an executive order on Friday that banned citizens of seven predominantly Muslim countries from travelling to the U.S. for 120 days, and blocked the entry of Syrian refugees to the country. The ban is part of fulfilling a Trump promise during his presidential campaign that was filled with anti-Muslim rhetoric. The office of Public Safety Minister Ralph Goodale said no motive has been confirmed. Last year, a gift-wrapped pig's head was left outside the same cultural centre, accompanied by a card reading "Bon Appétit." In 2014, the mosque was also the target of vandalism and hate mail. In a press conference in the early hours of Monday, Premier Philippe Couillard said Quebec, like so many places in the world hit by terrorism, would face it with courage. He mentioned public gatherings later Monday across the province would allow people to express their horror but also their solidarity, and highlighted a message to Muslim Quebecers. "We are with you. You are in your home. You are welcome in your home. We are all Quebecers," Couillard said. "We must together continue to build a society that is open, welcoming and pacifist." Quebec City Mayor Régis Labeaume was visibly shaken at the news conference. "No human should have to pay with their life for their race, their colour, their sexual orientation, of their religious beliefs," he told reporters. "I want to express my disgust against this villainous act. I want to tell the members of the Muslim community, those who are our neighbours, our co-citizens, that they can count on our support, our solidarity, but mostly I want to tell them that we love them." The mosque issued a Facebook statement early Monday after confirmation of the six dead. Some mosques in Canada were reportedly tightening security, while police in New York City were also on heightened patrol around places of worship after the Quebec attack. Last year, a federal report found that the terrorist threat level was "medium," meaning that a "violent act of terrorism could occur in Canada." It found: "The principal terrorist threat to Canada remains that posed by violent extremists who could be inspired to carry out an attack in Canada. Violent extremist ideologies espoused by terrorist groups like Daesh and al-Qaida continue to appeal to certain individuals in Canada." When he released the report, Goodale said it was his duty to inform Canadians about the threats. A photo of Aaron Driver is seen at an RCMP press conference in Ottawa on Aug. 11, 2016. "Homegrown terrorists" were behind two unrelated attacks in 2014 on Canadian soldiers. Warrant officer Patrice Vincent died of his injuries after being rammed by a vehicle in Saint-Jean-sur-Richelieu, Que. and Cpl. Nathan Cirillo was shot to death on Parliament Hill. The Ottawa shooter, Michael Zehaf-Bibeau, was reportedly admired by a fellow Canadian named Aaron Driver — who was killed during a police operation last August. Authorities believed that Driver, 24, planned to use a bomb to carry out a suicide bombing mission in a public area.